Henry Van Dyke was an American pastor in the 1800’s, of course, back when Time Attack didn’t exist (well, save for horse racing; which I suppose is a sort of time attack. 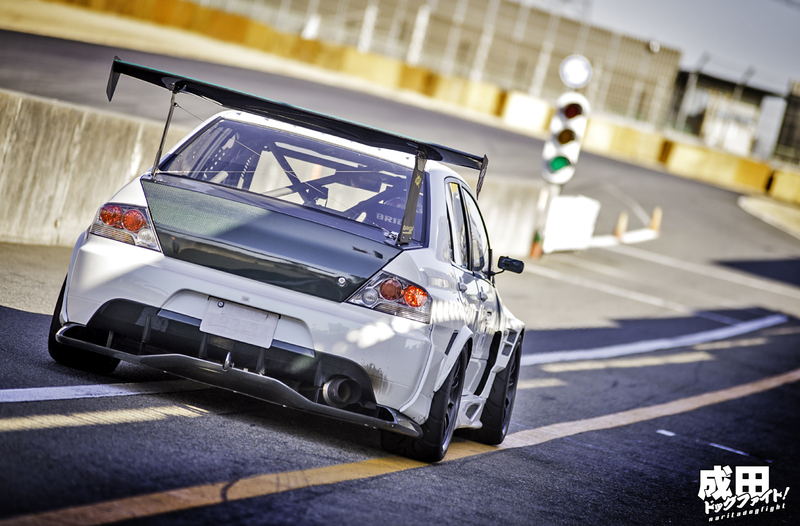 Actually, now that I think of it, it is some form of time attack). Anyway, no motorized sport was really going on then. Despite that though, he did have a solid grasp on the importance of time and how it can affect different people. It’s no secret that some value time more than others, and that time is not equal to all. Those who value time though, have a better idea of what it means. It’s the most valuable asset that any man can spend, and to those who understand that, to those who have a passion, it can be spent achieving great things. 58.114 seconds. A time so insignificant to the majority of people that we don’t even blink an eye at it. Even those who get that time is valuable, wouldn’t really think of anything under a minute as significant. There are a select few though, who beg to differ. 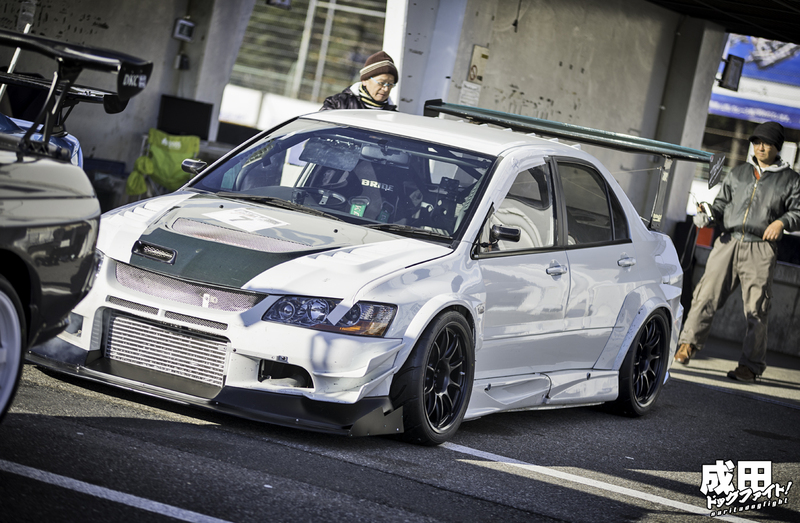 People like Ozaki Mitsuyoshi, the owner of this Evo, who by trade goes by Totomaru. People like Mitsuyoshi, who will put in countless late nights and long days to gain just a hundredth of a second track. 58.114 seconds. Mitsuyoshi’s personal best on TC2000, a hundredth shy of 57. Those who compete in the Battle Evome, and Attack series; these are among the rare people who truly understand time; Mr. Totomaru being no exception. Starting with his iconic pink, circuit built Evo RS VI, he’s made a name for himself in the time attack circuit as being among the fastest. Eventually working his way up to the need to upgrade to the EVO VIII you see here. 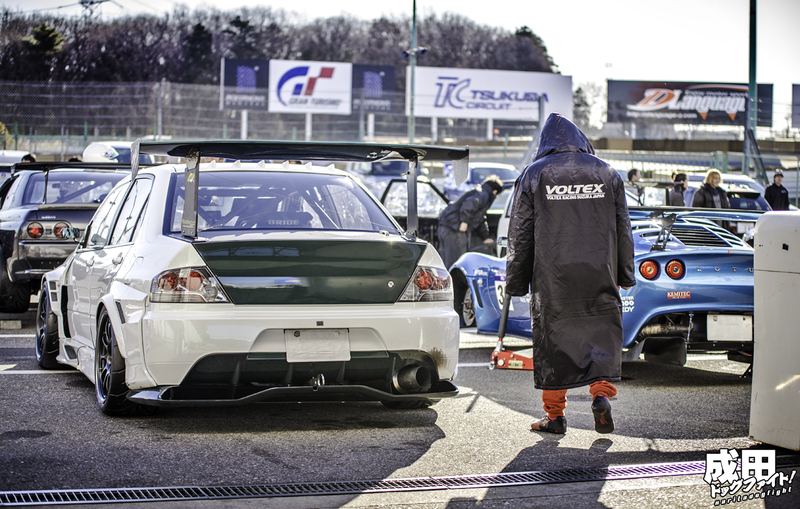 On this cold January morning at Tsukuba, during the second Evome event of this year, he clocked his personal best at TC2000. If I recall correctly, there were quite a few people who broke their own records that day; conditions were good. 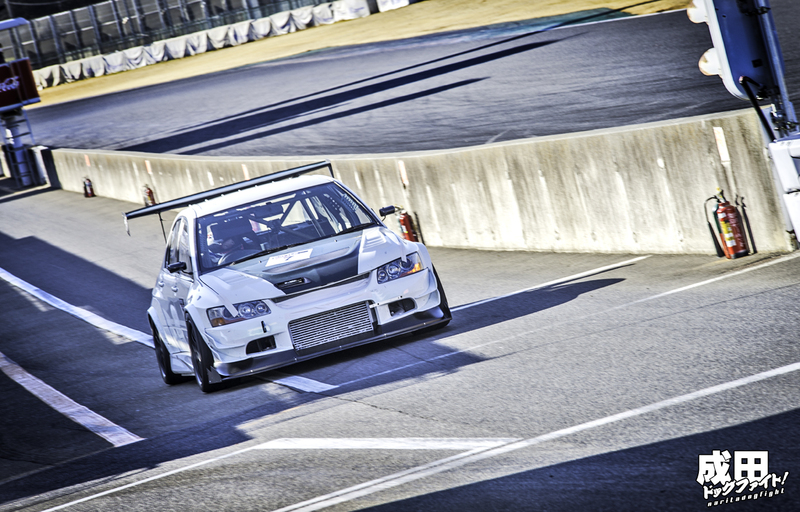 Take into consideration a 2’04.655 lap time at Autopolis in his CT9A and you have one formidable time attack competitor – keeping in mind that Autopolis is very unfamiliar to those out of Kyushu. 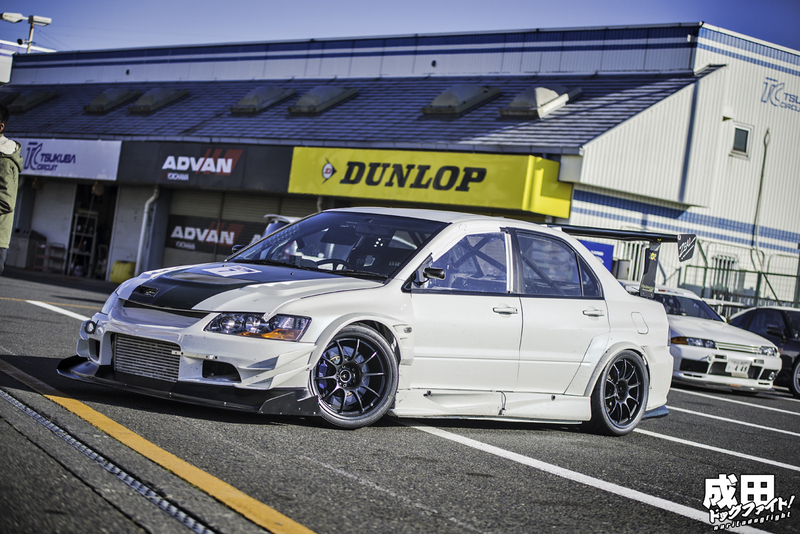 A few things had changed since I last saw this EVO. 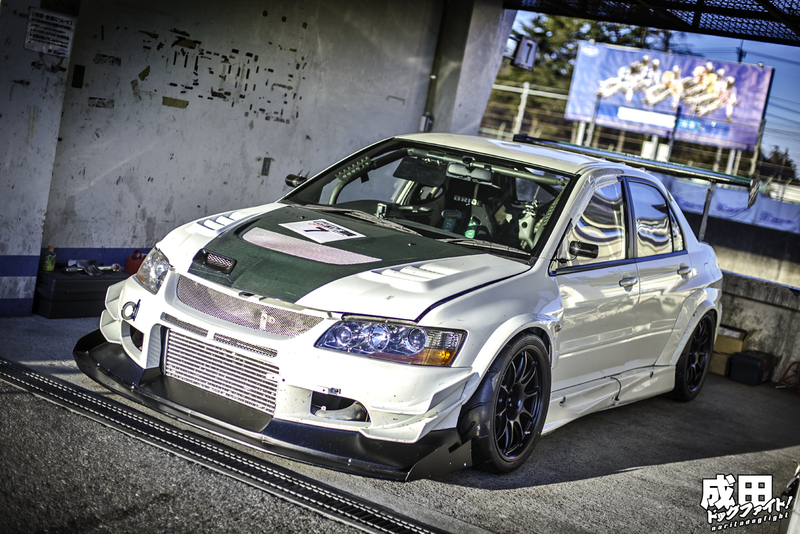 Although the Voltex wide-body had been somewhat unchanged, some changes had been made aesthetically; namely the green tinted carbon. The diffuser, wing element, hood and front splitter (all carbon pieces), had been tinted in a green hue. Somewhat insignificant, but it gave the car the a much more unique look. It certainly didn’t detract from the aggressiveness of the car; especially with the wing element rising above roof-line. Looks just as good on track as well. Just as we’d expect from someone who has been building and driving EVO’s for years. As he heads out for the first session of the day, fully aware of his goal, there is no doubt that the importance of time plays on Mitsuyoshi’s mind. Putting all other matters in the furthest reaches of his mind, focusing only on the present, he attacks the circuit. Taking each second as it passes, doing all he can to push the limits of both himself and his machine. One minute of clarity, a moment of violent peace. A moment in time that can be appreciated for what it is. Reblogged this on TB Car Work's.